If fire appears to leap from the vibrant green surface of the Peridot, this may be because this gem is formed as a result of volcanic activity. Many years ago, natives discovered Peridot crystals in the black sands of Hawaii, explaining their presence as tears shed by Pele, the volcano goddess. Throughout history, August birthstone has been used as a means to connect with nature. Early Egyptian priests drank a stimulating beverage called Soma from cups made of Peridot, believing this practice to draw them closer to Isis, the goddess of nature. 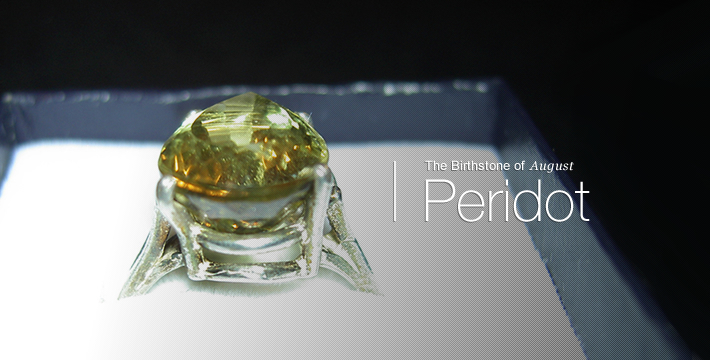 The name Peridot comes from the Arabic word faridat, meaning gem. Ancient Egyptians called them the gem of the sun, because of their dazzling brilliance when seen in the desert sun. It was believed that the Peridot glowed with light even as darkness fell, which is why miners were said to have scouted for these gems during the night, marking their location, and returning in the light of day to retrieve them. Perhaps this legendary mining method is the reason that the Peridot is sometimes called evening emerald. Peridot is a mineral named Olivine, which is found in a variety of greens, ranging from light yellowish green to a dark olive. Early mining for this gem was done on Saint Johns Island near Egypt around 1500 BC. The green crystal was considered protective against evil and when set in gold, especially helpful against night terrors. It was ground to powder and used as a remedy for asthma and as a cure for thirst brought on by fever. Today, Peridot is mined in Burma, Norway, Brazil, Australia, Hawaii, the Congo, and in Arizona. An alternate birthstone for August, Sardonyx is a type of translucent or opaque quartz with alternating parallel bands of brownish red and white. This stone was worn as a talisman by the Egyptians to protect against infections and evil. Today it is highly polished and carved into beautiful beads and cameos. Sardonyx is mined in India, Germany, Czechoslovakia, Brazil and Uruguay. A gift of this stone is considered symbolic of happiness within a relationship.